Sharp Corp (OTC: SHCAY (ADR) ), the worlds largest producer of solar cells, announced on Thursday it would invest 22 billion yen ($200 million) to increase capacity for thin-film solar cells at its Katsuragi Plant (shown left, Nara Prefecture, Japan) from the current level of 15 MW (megawatts) to 160 MW (160,000 kW) per year by October 2008. Thin-film solar cells are fabricated by depositing thin layers of silicon on a glass substrate. This structure enables a dramatic reduction in the amount of silicon raw material used to approximately one hundredth the amount used in conventional crystalline solar cells, and also provides for shorter production process times and lower costs from manufacturing economies of scale. Sharp began mass production of tandem thin-film solar cells with a tandem-junction structure (amorphous silicon and microcrystalline silicon) in September 2005. Now, Sharp is making thin-film solar cells with a triple-junction structure, which consists of two amorphous layers and a microcrystalline layer. With these triple-junction thin-film solar cells, Sharp has achieved module conversion efficiencies of approximately 10%, at the industry's top level. According to this earlier announcement Sharp was to increase annual production capacity for solar cells at its Katsuragi Plant to 600 MW by November 2006, the world's highest. This current announcement would bring the total to 765 MW. 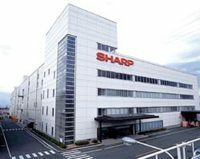 This Reuters story reported that Sharp had previously announced plans to ramp up its thin-film capacity with a new plant in Sakai in Osaka prefecture to go online by March 2010 and eventually target output of 1,000MW per year at this facility. Sharp also has UK production capability of 220MW. I wish there was some announcement about the cost of these cells too !! Anyway, it is good news for all. It would be nice to know future prices. We have a lot of PV manufacturing capacity coming online in the next couple of years. Perhaps the sellers market for modules will end? My quess is that thin film is cheaper than the traditional crytalline solar cells. It is less efficient, these are claimed to be 10%, most wafer based cells are around 15%. Also there have been questions as to their lifetime. So clearly the market will demand that thinfilm prices are lower than silicon. Also the material and manufacturing costs are much lower. Personally I think thinfilm, and concentrating photovoltaics are the future of the technology. I doubt bulk silicon will ever get cheap enough. And, at least for utility power operations they have to compete against solar-thermal. Since the amount of electricity actually produced by any PV system is very small, reducing the environmental impact of producing panels is a very good thing. I think there is business opportunity for faux solar systems made from environmentally friendly materials. Google could put them on their roof, take a picture, and claim credit for the amount of energy saved by using recycled materials. BigTom, http://www.solarbuzz.com/ indeed shows that the cheapest thin film solar modules are cheaper per watt than the cheapest crystalline silicon modules. The seller's market may not be over yet, but I am encouraged to see module prices finally starting to drop again. XsunX, Inc. is a thin-film photovoltaic “TFPV” company that has spent the last three years in focused research with a photovoltaic material called Amorphous Silicon. During this time we have developed the technical capabilities, qualified core staff, and market understanding to take our technology to market. The products that we intend to mass produce are amorphous silicon solar modules on glass panels. To deliver our products we have begun to build a multi-megawatt TFPV solar module production facility in the United States to meet the growing demand for solar cell products used in large scale commercial projects, utility power fields, and other on-grid applications. Employing a phased roll out of production capacity, we plan to grow our manufacturing capacities to over 100 megawatts by 2010. Our multi-megawatt system design consists of a series of integrated material handling, substrate cleaning, thin film materials deposition, laser segmentation, lamination, and packaging systems necessary to convert an inexpensive piece 100cm X 160cm sheet of glass into a complete solar module in less than three hours using a fraction of the semiconductor material used to produce crystalline silicon solar modules. What is the efficiency of the XsunX thin film product? I think it's nice they actually mention an efficiency, and it matches the numbers in http://www.physorg.com/news88965013.html . I wonder what their warranty period is. XsunX INTENDS to deliver thin film solar products that provide extra value in performance. Intends: is the Key word.They have been intending to do something for years. XSUNX: Is a penny Stock only. We are watching the product availability as many of our customers are looking to install Thin Film. Please add any comments or new players' information related to "Solar Cube" technology. Enable global adoption of renewable energy. We provide free cost estimates and expert advice to customers of renewable energy. When I saw this announcement, I went to the Sharp Solar USA web site to find a module specification. I was wondering if the 10% was an STC rating. I was also wondering about the module size as scale-up in size has been a problem for thin films modules since they can't cut out the bad cells. I did not even find a module with the 8.6% efficiency for the 2 layer device, much less the 3 layer device. At least the First Solar web site has a module spec although you need to go to the German version to figure out the panel efficiency which is less than 8% if I remember right. It is also only a 60 W module. I am nummed at hearing about thin film solar cells and I keep looking for product specs to get past the hype. Besides the performance, there are the price, reliability, and warrenty issues. Anyway, this announcement is good for solar company stock prices including that of Sharp. thin film solar cell will be popular. Quite good post. I think thinfilm, and concentrating photovoltaic are the future of the technology. I doubt bulk silicon will ever get cheap enough. I want a movie made after 1990-ish that's not supernatural-related and is just a really good horror movie. I've seen Halloween and Saw. They were pretty good but not the best. My all-time favorite horror movies are the three Scream movies, and The Last House on the Left. Movies similar to those? Suggestions? Thanks! Great news, I just hope that this comes with a more possible and reasonable price. I know, this panels can be very expensive, but I still hope that it falls to a price where more people can afford it. I'm sure, if that happened more people will be go for greener energy and benefit from Solar Power. We all eat healthy food to gain energy but it is seen that some people want more energy then what an ordinary food meal provides. Uma grande empresa com uma grande historia, tenis oakley e tambem este tenis nike é isto ai. With so much production of solar panels I am wondering where they will be poping up. Is this Sharp the same as the one that makes tv's? Wow amazing what we can do with cells like this, what's going on with this presently?